Jordana is currently writing a (history textbook/)novel entitled THE WARD, forthcoming from KT Books/HarperCollins in 2013. 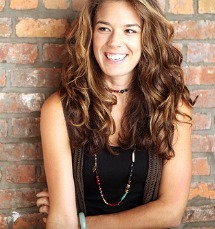 She also teaches creative writing workshops for kids ages 8 to 18 through Writopia Lab, a non-profit organization based in New York City. Weirdly, no. Writing has always been something that I’ve done. When I started writing The Ward, even then it wasn’t with the intention of “being a writer.” The writing stemmed from a need to explore the life of one character. And then the book was picked up, and suddenly – BAM – I’m a writer! But nothing’s changed, you know? I went to school for poetry, which will always be my first love. That I really love to write essays, even though I will probably never write another essay again. Not sure why that’s the greatest thing, but for some reason it feels important. Sometimes you can say something a billion ways and people won’t get it, and then you stumble upon the one way that just makes sense, and everyone will get it. That’s along the lines of “less is more” but really, it’s about finding the clearest, briefest way to deliver important information. 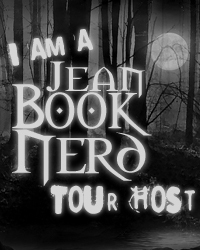 In your debut novel; The Ward, can you tell my Book Nerd community a little about it? It’s about a sixteen-year-old girl who discovers the legendary _____. She wants to use it to heal her sister, but is caught in an age-old conflict between the governor, who want to use it for his own evil purposes, and by those who want to keep it hidden. What was one of the most surprising things you learned in creating Aven? That, as good and as wholesome as she is, man does she want to go on her first date. And get kissed. For those who are unfamiliar with Ren, how would you introduce her? You’re probably not going to like her, because let’s face it— she’s probably not going to like you. She’s got a whole mess of assumptions about people she’s never met. Her life has been so very small. But if you try to get to know her, and you show her how wrong she is about you, she’ll give you a chance. And once that happens, then – only then – will she make sense enough for you to like her… maybe even love her. What part of Derek did you enjoy writing the most? I liked how indoctrinated he is. He’s been living one way for centuries, and I had to try and see it from his perspective. Why would someone hide the _____? Is there any merit in that choice? I liked the moral questions. If you could introduce Callum to any character from another book, who would it be and why? Oof. How about the Cheshire Cat? Callum would not do well in Wonderland. Not enough structure. The twenties, without a doubt. Summer camp. I was the “jewelry girl” and I got to bling out all the campers. It was pretty memorable. Bad day—no one. I’ve learned that complaining, or even venting, doesn’t make me feel better. If I have a bad day, I tough it out. Unless I feel like there’s something to be solved. Then I call my grandma. I tell my friends that I love them all the time! Who was your fist boyfriend? My first real boyfriend is actually named Justin, and he provided some of the inspiration for Callum (Justin Cory). We’re still good friends. I turned to him for all the science-y stuff in the book, since he went to med-school. Boo. I dunno…what time is it? I once dreamed that I was part of a colony of people who were living on another planet, and we’d developed these weird lumps all over our green skin from being so close to the sun. We as a people were called “wrenches”, bc that’s what out lumps were called. A meteor that met Earth caused a global rise in seal level that transformed Manhattan into the Ward, a city surrounded by water. Fresh water is rare and a cancer called Blight is rapidly spreading throughout. To survive in this harsh environment, risks will have to be taken. Sixteen-year-old racing daredevil Ren, the risk-taker that she is, will do anything to help her ailing sister. Hoping that a secret government mission to search for fresh water will point to a cure, Ren jumps at the chance to participate. She quickly learns that this mission is not exactly what she signed up for. It is full of deceptions with a dreadful mystery waiting below the water. 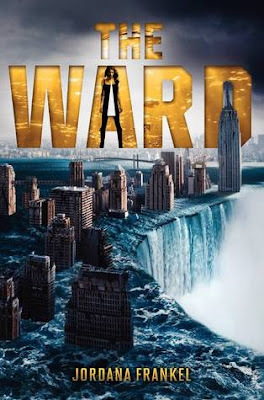 Jordana Frankel’s The Ward is an amazingly written dystopian read that is full of unexpected twists and turns. Ren is certainly a strong heroine and with her heart in the right place. She is easily relatable as she will do anything for her sister, even if it risks her own life. She possesses personality qualities that readers will find admirable. At first she comes off as being detached but it was her way to guard herself and more importantly, her heart. She’s also a mobile racer, which is her main source of income. Readers will love that she is true to herself. This world that Jordana has created is a showcase of a future that many have come to predict: an Earth that is seemingly being drowned. The writing style that is contained in this book will coat your eyes with a visual of a world with a depleting supply of resources. It is quite shocking how a single event can totally change the way we live. Fresh water as being rare and considered a luxurious commodity is a uniquely interesting twist. Something that we take for granted like fresh water is a far-fetched idea of becoming a symbol of health and happiness, but Jordana clearly shows that in a harsh world like the one Ren lives in, it can be a reality. The culture within the Ward was a nice touch. It provided the story with a little hint of fantasy. The debut novel of Jordana Frankel is full of mystery, romance, and adventure. It offers something different from your choices of dystopian tales out there. The Ward is an interesting world with a multifaceted and exhilarating plot that will have you compelled throughout. Thank you Jordana for making this giveaway possible. 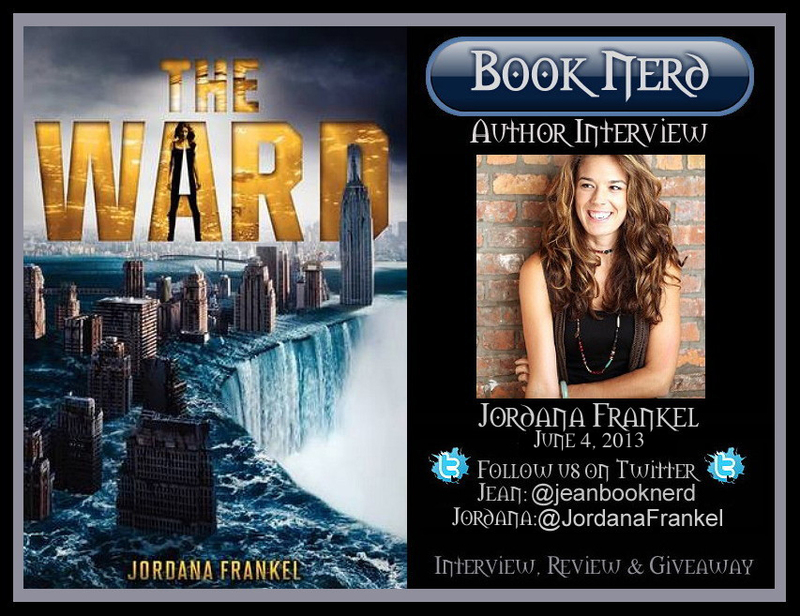 1 Winner will receive a Copy of The Ward by Jordana Frankel. Thanks for the book donation. I cannot wait to read it.